To make the chermoula, combine the coriander, parsley, chilli, garlic, saffron, cumin and lemon juice in a large glass or ceramic bowl. Cut fish into strips about 6 cm long and 4 cm wide. Add to the chermoula. Toss to combine. Cover and place in the fridge for 2 hours to marinate. 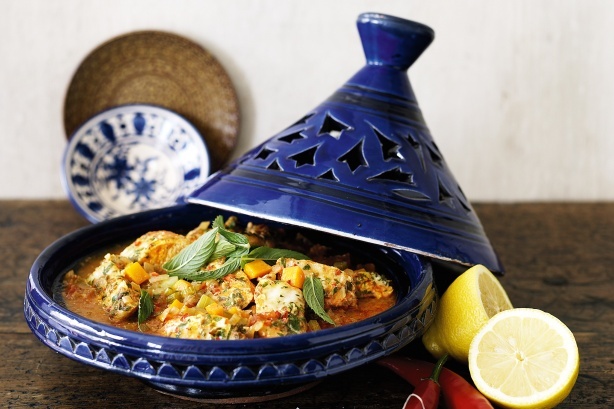 Heat the ghee or oil in a 28 cm flameproof tagine over medium heat. Cook onion, celery and carrot, stirring, for 8 minutes or until onion softens. Add the tomato and stock and bring to the boil. Reduce heat to low. Place the fish on top of the onion mixture. Cover and cook for 10 minutes or until the fish flakes when tested with a fork. Top with mint leaves and serve with lemon wedges, if desired.